REGINA – Perfection can’t be beaten. John Epping found that out the hard way. 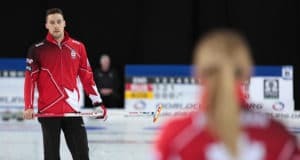 Team Canada skip Brad Gushue was scored at 100 per cent in a 6-2 win over Epping’s Ontario (Toronto) squad in the Page playoff 1-2 game Saturday to advance to the final of the 2018 Tim Hortons Brier, presented by Mosaic. The Gushue gang will be gunning to be the first team to win back-to-back Tim Hortons Brier titles since the Calgary trio of Pat Simmons, Carter Rycroft and Nolan Thiessen did it in 2014 (with skip Kevin Koe) and 2015 (with Simmons skipping, and John Morris taking Koe’s place in the lineup). Ontario will face Alberta in the semifinal 11 a.m. Sunday with the winner advancing to the final against Team Canada at 6 p.m. Brendan Bottcher’s Edmonton team edged Northern Ontario (Sault Ste. Marie), skipped by Brad Jacobs, 6-5 in an extra end earlier Saturday. “Under the lights, it was a great experience. We’ve got to use that tomorrow to make sure we come out and play well. I think we’ll have a good day tomorrow,” said Epping, who plays with third Mat Camm, second Pat Janssen, lead Tim March and coach Jim Wilson. “We’ve got to be sharp. We’ve got to make lots of shots tomorrow. Brendan, he’s feeling it. Man, you can just tell, he’s playing well right now. Team Canada had the best round-robin record at 10-1. They only team Gushue didn’t beat was Alberta. If it’s Ontario that advances, Gushue will have to defeat Epping three times in three days to claim the coveted curl crown again. In the Ontario championship, Epping lost to Glenn Howard in the round robin and the Page playoff before prevailing in the final for his first trip to the Brier. But first he would have to get by Bottcher. This is Gushue’s 15th Brier. 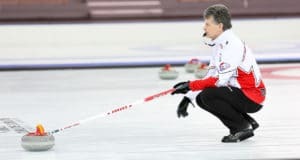 The St. John’s skip became the winningest skip in Brier history earlier this week surpassing Russ Howard and Kevin Martin, who were tied at 113, and Saturday’s victory was his 122nd. In the second end, Gushue managed to split the house early and parlayed it into two points to open the scoring. Epping had a double to blank in the fourth end but only got one giving up a steal to trail 3-0. Then in the fifth, Epping nosed an attempted blank and took one to be down 3-1 without the hammer. Gushue used the splitting the house formula effectively again in the sixth end to go ahead 5-1. In the eighth, with Gushue lying two, Epping was forced to draw for one and a 5-2 deficit before Gushue assured victory with a draw to the button for one. The winning team receives $62,000 in prize money, and will represent Canada at the 2018 World Men’s Championship in Las Vegas, March 31 to April 8. 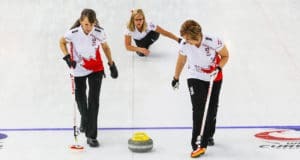 If the team reaches the podium in Vegas it will be invited to participate at the 2019 World Financial Group Continental Cup as part of Team North America. Victory also means becoming Team Canada at the 2019 Tim Hortons Brier in Brandon, Man. Sunday’s runner-up will go home with $52,000, the third-place finisher earns $42,000 while Northern Ontario receives $32,000 in prize money. The 2018 Tim Hortons Brier, presented by Mosaic, continues Sunday with the semifinal at 11 a.m. and final at 6 p.m. (all times CST). TSN and RDS2 (streamed on ESPN3 in the United States) will provide complete coverage of the 2018 Tim Hortons Brier. Go to www.tsn.ca/2017-18-curling-broadcast-schedule-1.593081 for the complete schedule.